Rendering of Amazon’s Oak Creek facility. Rendering from BL Companies and the City of Oak Creek. It’s official. Amazon will open a second distribution center in southeast Wisconsin, this time in Oak Creek. Amazon will operate a four-story, 2.6-million-square-foot building. The project is slated for a 75-acre site just off of Ryan Road, located in what will become the Ryan Business Park. Hillwood Development Company, based in Dallas, Texas, will build and own the land and buildings. Project costs are estimated at $200 million. 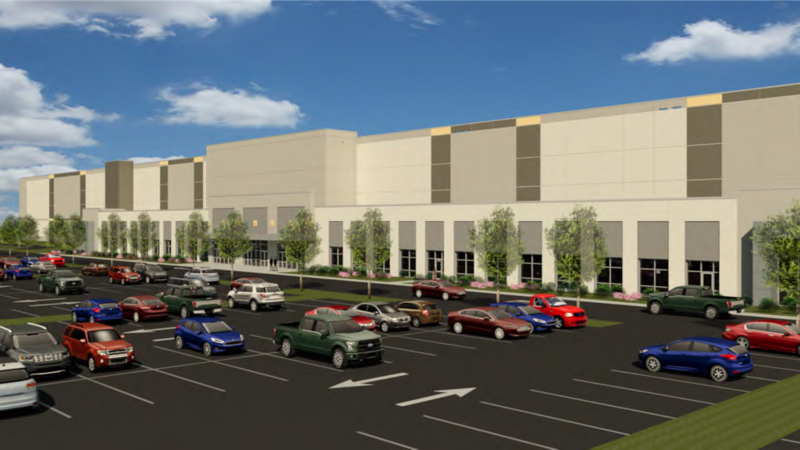 The location is planned to be both larger than the Kenosha warehouse (2.6 million square feet versus 1.5 million square feet) and to employ more people (1,500 versus 1,100). Robotics are expected to play a large role in the new facility. The project will receive funds from the City of Oak Creek through a tax-incremental financing district worth more than $16 million, Andrew Weiland reported in BizTimes. Oak Creek officials approved the $16.9 million TIF deal last week. “Amazon will become the city’s largest employer and contribute significantly to our tax base, helping the city to continue to keep taxes low and services high for our residents,” “said Oak Creek Mayor Dan Bukiewicz. The center is expected to employ approximately 1,500, and eventually pay annual salaries totaling $40 million by 2021 according to a guarantee provided by Amazon. A brewery hailing from the Door County was announced this week as a future tenant of J. Jeffers & Co.’s redevelopment project at 2018 E. North Ave. Readers may remember this building was previously home to the bar and restaurant called G Daddy’s BBC. Now closed, the former space is being redeveloped by Joshua Jeffers’ outfit. Hacienda Brewing Company, a brewery owned by Door County Brewing Co., will be a tenant on the first floor. The Hacienda space here in Milwaukee will have a 125-seat taproom, with beer from their brewery in Baileys Harbor, Kathy Flanigan reported in the Milwaukee Journal Sentinel. This new space will be just blocks away from the Good City Brewing, the Farwell Ave craft brewer. This project is part of Jeffers’ redevelopment of the historic former BBC building, and the adjacent Hotel Foster space, into a mixed-use development with office space and room for retail and restaurants on the street level. This can’t be right, the $40m annual salaries dividied into 1500 employees equals $26,700 annual salary, or roughly $12.85 an hour, (based on a 40 hour work week). The “Amazon Guarantee” is a guarantee they will create “working poor” jobs, heck we got plenty of those. Why did they get a tax incentive to do us this great favor?